View the completed Small Slab Menorah With Snakes and Eyes here. This is a small (7.25 inches long, 4.5 inches tall) slab menorah with a pattern of snakes and eyes. View the completed Small Commission Chamsas here. I have an Etsy commission for 1.5 inch chamsas with holes on both ends so that they can be strung together to make jewelry. The initial commission was for ten, but I wanted to experiment with different shapes and textures and ended up with 36. I think this is one last set of distorted metachamsas. These are two small (1.75 inch) chamsas. 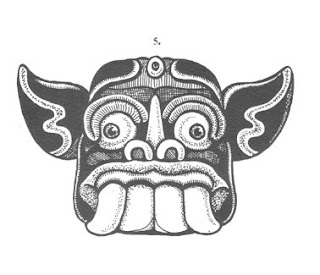 This is a slab pot with 57 spikes and a face inspired by a Nepalese design. I've used the skull face before in this clay mask. This is a video of each step in the process of making this pot, with music by The Orb, The Soggy Bottom Boys, Jello Biafra, and 10,000 Maniacs. I like documenting the process, but from now on I'm going to turn the pot a little faster. This is a slab pot with 51 spikes and a face inspired by an image from Treasury of Fantastic and Mythological Creatures by Richard Huber, described as a "sun with human features, from a bronze figurine, Upper Volta." Upper Volta refers to the West African nation which renamed itself Burkina Faso in 1984. 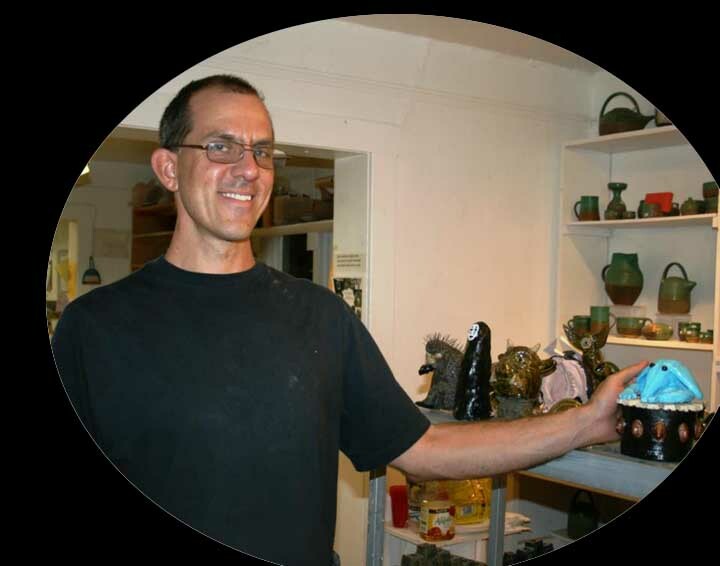 Video with 360° view of Upper Voltan Spiky Pot with music by Pedro, Muriel, and Esther. 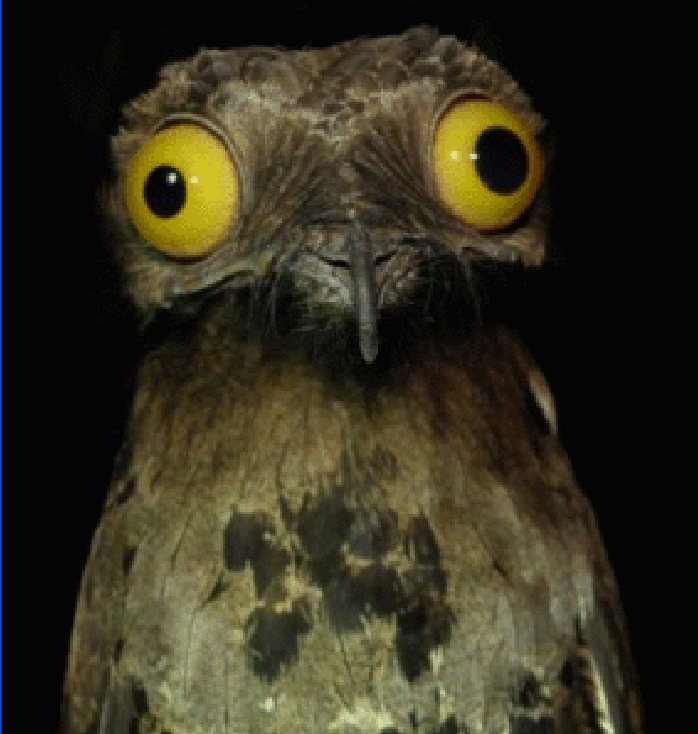 This is the Cyclopean Giraluna. It's 18 inches tall, the tallest clay piece I've made. The giraluna is one of the plants described in Parallel Botany, Leo Lionni's alternate universe botany textbook, one of my earliest inspirations for clay art. I've made many of them over the past nine years. This one doesn't have much in common with the giraluna as described in the book which have seeds which serve no purpose at all since the parallel plants do not reproduce, and not an ever vigilant eye. I just realized as taking these photos that the top part of the giraluna is also The Elder Sign, a symbol used in the fiction of H.P. Lovecraft (although the image of the eye in a five-pointed star itself is an invention of August Derleth). Leo Lionni also wrote beautiful and psychedelic children's books such as Alexander and the Wind-up Mouse. View the completed Blue Spiral Slab Menorah here. Most of my past menorahs have been constructed of large blocks of clay. They take a long time to dry, are potential explosive in the kiln, and the finished product is very heavy. Last year I experimented with a few slab menorahs, made from flattened slabs of clay attached using slip (liquid clay). The only drawback is that the dimensions of the menorah have to be planned in advance and the components must be dry enough to hold their shape and wet enough to allow scoring (scratching the clay to increase surface area for a more permanent attachment). I spent a good amount of time planning out the dimensions, but they still didn't come out exactly right. This may be because, as it is manipulated, the dimensions of the clay slabs can change. Here are the component slabs. Here is the assembled menorah. This project took about an hour and a half this morning and another two hours this evening. It's a very reasonable time commitment. 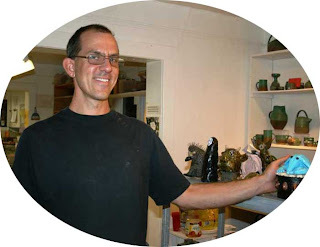 I posted my Triangular Eye Pot to the Outsider Art group on Facebook and I had two interesting and positive reactions. This one compared the pot to the potoo bird. This one compares the appearance of the pot to the class of celestial beings known as the Thrones. In addition to Biblical references, they're mentioned in the song "God Save the People" from Godspell. My Zebra Devotion sculpture sold yesterday so I made this new Devotion sculpture in celebration. I don't remember why I started calling them Devotions. They are macabre Halloween decorations with faces from a rubber doll mold. 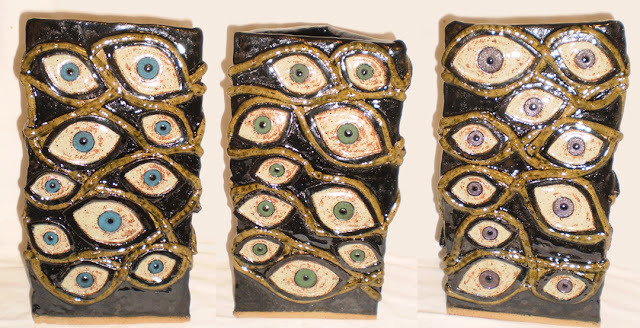 This is a hand-built triangular slab pot with 30 molded eyes. It took about 12 hours to build and glaze. I decided to stop naming these eye pots after their number of eyes. Thirty-Eyed Pot? Don't let's be silly now. Last year, I was running Dungeons & Dragons Encounters in a local gaming store. Encounters is a series of adventures provided by the publisher with the intention of attracting new players/consumers to their product. There was one point during this particular story, Beyond the Crystal Cave, in which the players had the opportunity to use giant otters as mounts. I made the clay miniatures but they didn't get done in time for the game. Over a year later, I finally got around to painting them. Some are more otter-like than others. One looked more like a tiger cub so I painted it as such. The otters are designed to allow a D&D mini to be placed on top. This is illustrated with my Kenku assassin. It would probably work better with the standard plastic figures. 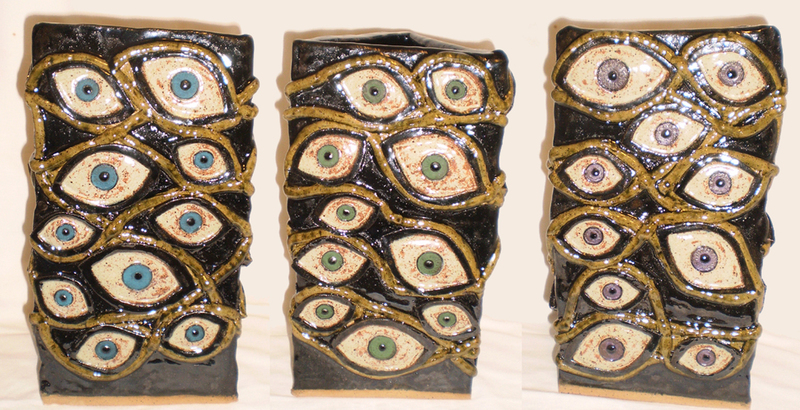 This is a hand-built slab/coil pot with ten large molded eyes that wrap around the pot in a linear pattern. 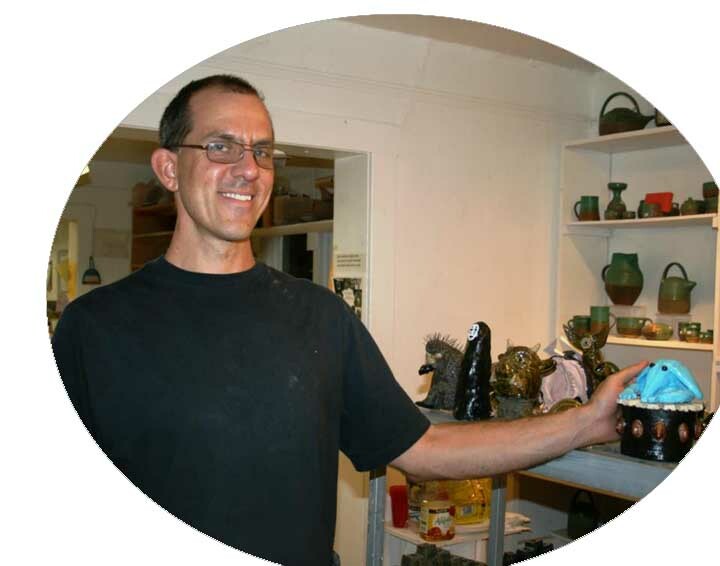 This pot was constructed by making coils of clay, flattening them, and attaching them around a base with slip. The result is a very sturdy pot, but the thickness is obviously not uniform. I've switched to a slab method for all future pots. These are press molds made from the most recent group of metachamsas. This is a hand-built slab pot with a face from a Balinese design. It's 6.5 inches is diameter (not counting the ears) and 5.5 inches tall. It has 105 spikes. 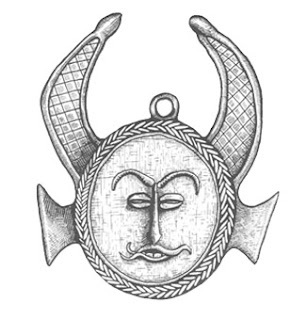 This is the image the pot is modeled on, from Treasury of Fantastic and Mythological Creatures by Richard Huber.